Check out the #GridWeek infographic titled Understanding the Grid which not only outlines how electricity gets from a power plant to your home but also features grid innovations (smart meters, energy storage, microgrids) and the job opportunities available in the power grid sector as the current workforce retires and as new technologies become adopted. The US EPA has just released an interactive board game developed by physical scientist Rebecca Dodder, PhD, in collaboration with classroom teachers and others at the EPA, and this is a game that teachers are going to love incorporating into their instruction! The Generate! 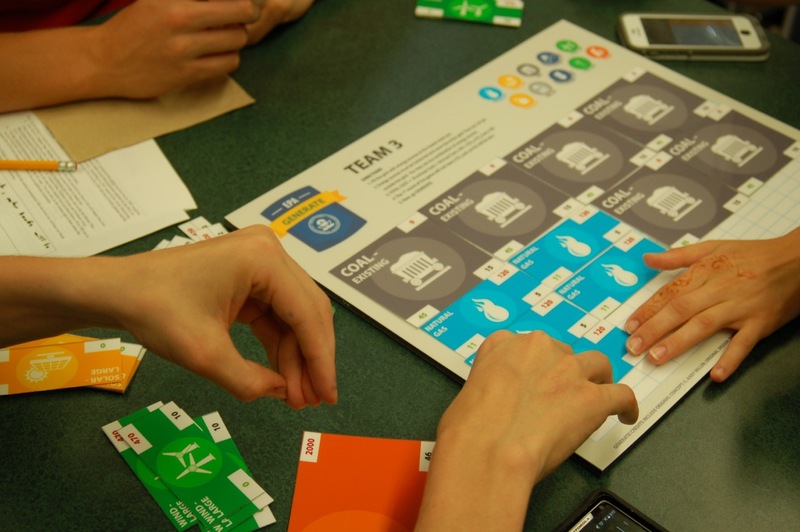 Game lets participants engage in friendly competition while conducting a simulation that enables them to examine the costs and benefits of using varied fossil and renewable energy sources to power their electrical grid. Each team is given a game board which represents their power grid. Every team has same size grid and thus can generate the same total amount of energy, but teams do not have the same mix of energy sources. Each team assembles a portfolio of energy sources for their grid under constraints provided by the facilitator – which group can come up with the least expensive energy portfolio? Which group can come up with a portfolio that generates the least amount carbon dioxide emissions? Which energy portfolio utilizes the least amount of water and would presumably be more resilient during a drought? How does the addition of energy efficiency measures impact costs? emissions? I have seen this game played numerous times, both with high school students and teachers and it is always well received. In fact, most people want to keep playing the game as each round brings an improved understanding of the kinds of decisions that must be taken into account when choosing which energy sources will be used to provide electricity. This game is a very effective instructional tool that cultivates critical thinking about the energy sources used to generate electricity both now and in the future. On Monday June 2nd, the EPA proposed its Clean Power Plan that is intended to cut U.S. carbon emissions from existing power plants by 30 percent (compared with 2005 emissions) by 2030. The reductions in carbon pollution that will need to be implemented will be different for each state given that each state utilizes a different fuel mix for electricity generation and may already be incorporating low-carbon technologies at existing power plants. According to the EPA, “states can choose the right mix of generation using diverse fuels, energy efficiency and demand-side management to meet the goals and their own needs.” You can view the June 2nd press release here. According to data from the US Energy Information Agency (EIA), in 2012 NC ranked 15th nationally in terms of its contribution of carbon dioxide emissions from the electricity sector. The EPA’s Clean Power Plan interactive map tool enables users to click on a state to learn more about EPA’s carbon reduction goals for that state and to learn about the fossil fuel fired power plants covered by the proposed plan. 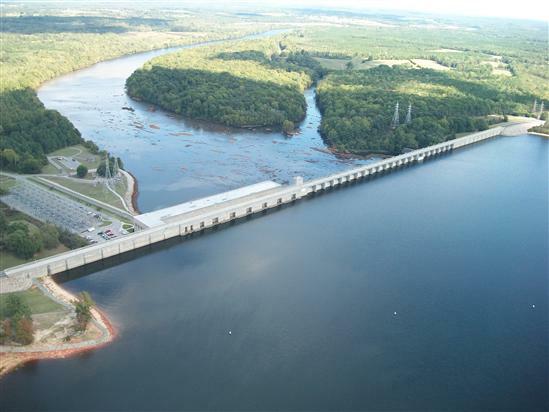 The EPA has proposed that North Carolina lower its carbon pollution to 992 lb/MWh in 2030. North Carolina’s 2012 emission rate was 1,646 pounds/megawatt hours (lb/MWh) so this represents a 40% reduction in emissions by 2030. You can read more about what this plan means for NC by reading the June 2, 2014 News and Observer article, EPA calls on NC power plants to reduce emission rates 40% by 2030. According to the article, which referenced Jonas Monast, director of the climate and energy program at Duke University’s Nicholas Institute for Environmental Policy Solutions and adjunct professor at the UNC School of Law, federal projections show North Carolina is already on track to see an 18 percent drop in carbon emissions by 2020, compared with 2005. Fact sheets and details about the proposed rule are available here. This graphic from the New York Times may also be useful in instruction. 1. Energy, water, and land systems interact in many ways. Climate change affects the individual sectors and their interactions; the combination of these factors affects climate change vulnerability as well as adaptation and mitigation options for different regions of the country. 2. The dependence of energy systems on land and water supplies will influence the development of these systems and options for reducing greenhouse gas emissions, as well as their climate change vulnerability. 3. Jointly considering risks, vulnerabilities, and opportunities associated with energy, water, and land use is challenging, but can improve the identification and evaluation of options for reducing climate change impacts. Each chapter of the report includes interactive graphics as well as figures and graphics that can be downloaded for use in the classroom. Check out the interactive version of Figure 10.4 that shows the energy production by source, amount of water withdrawn by key sectors and land cover type for each region of the US along with projected climate change impacts. This figure provides an at-a-glance view of water, energy and land use that can be used by students as they consider how projected climate impacts might influence each of these sectors in their region. So the next time you ask students to critically evaluate the various energy sources used by society, encourage them to also consider the role of water and land in the mining and acquisition of energy sources, the generation of electricity, and the manufacture and delivery of transportation fuels. The theme of the 2014 World Water Day on March 22 is water and energy. As a teacher, you may be interested in seeing how many of the event’s key messages, designed to raise awareness about water and energy, are relevant to your teaching and perhaps that you are already incorporating into your instruction. In recognition of World Water Day, today the United Nations released the 2014 World Water Development Report (pdf) that is divided into two volumes – Volume 1 – Water and Energy and Volume 2 – Facing the Challenges, which includes thirteen case studies from around the globe that illustrate “that an array of opportunities exists to exploit the benefits of synergies, such as energy recovery from sewerage water, the use of solar energy for wastewater treatment, and electricity production at ‘drinking water power plants’. These examples also showcase alternatives to fossil fuel-based energy production, including hydropower development, geothermal energy, solar power and biogas.” There is one US case study about Austin, Texas, which is at “the centre of energy-rich and water-stressed Texas” that highlights the city’s water and energy conservation programs, including a reclaimed water program. These case studies are brief and reader friendly and could be useful to students seeking not only to understand the interplay between water and energy but also to examine innovative solutions for conserving water and energy around the globe. There is also a useful list of additional documents and information resources, which includes links to related infographics, activities for youth, and articles. Facts and figures from the 2014 report are also available. I’d love to hear how you use any of this information with your students! This free iPad app from Shell “explores the role innovation plays in producing energy to power and sustain our lives.” Stories with interactive features are organized into four sections: Innovative Thinking, Meeting Demand, Energy Efficiency and People and Planet. A two minute video about this app can be viewed here. While this app can be useful to teachers and students, teachers will want to be sure to remind students to be mindful of who is presenting this information and teach them how to identify potential bias when reviewing scientific information. It would be valuable to have students investigate a particular story presented in the app from different perspectives by gathering related news articles, press releases, etc. I would love to hear from those of you who have used this app with students – what stories have you found useful in your teaching? How do you prepare your students to critically evaluate what they read and look for evidence of bias? Our choice: A Plan to Solve the Climate Crisis is one eBook that comes highly recommended by a few teachers I know and it was also picked as a Best App or website for Teaching & Learning 2013 by the American Association of School Librarians. This interactive eBook includes photography, interactive graphics, animations, and more than an hour of documentary footage. In 2011 it won the Apple Design Award for its “groundbreaking interface.” This eBook includes 18 chapters, including chapters on solar and wind energy, geothermal, biofuels, the smart grid, carbon capture and sequestration and nuclear energy! You can purchase this app from iTunes for $4.99. If you use this resource with your students, I’d love to hear from you!